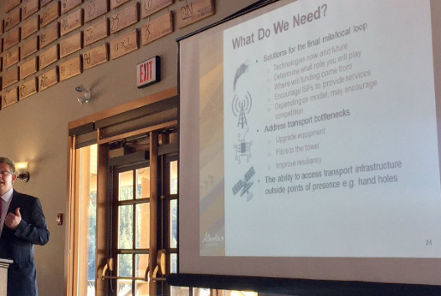 This post will offer some reflections on the Digital Futures Symposium on broadband, held March 16 & 17 in Cochrane, Alberta, and updates on Alberta’s SuperNet. I attended the first Digital Futures Symposium in Calgary in 2013, which turned out to be a great opportunity to learn about topics that I was becoming very interested in, like the SuperNet and the work that was underway to turn Olds into a gigabit community. 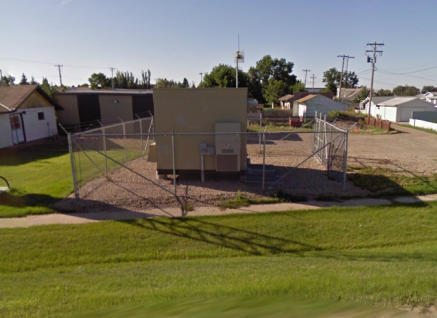 At the end of that event, it was evident that there was a lot of frustration in rural Alberta over inadequate connectivity, but there wasn’t much going on to address this frustration. The organizers (academics with the Van Horne Institute) and some of the participants expressed a desire to keep working on these issues through some sort of ongoing collaboration. While I had my doubts about what this would produce, three and a half years later Digital Futures has become more relevant and useful than ever, and it is now just one of numerous efforts around to province to collaborate on rural broadband. The group of academics organizing the Symposium has seen some change of personnel (one of the original Professors from Van Horne is now CRTC Commissioner Linda Vennard, who visited and participated in that capacity), and each of the meetings sees new faces coming with their own local concerns and questions. This latest Digital Futures was attended by some of the actors that were notably missing in 2013 — TELUS was one of the sponsors, and was there to make clear that it was very interested in working to meet the needs of local communities (some people were recently doubting the incumbent’s interest in rural Alberta). Axia, an original sponsor, also came with a substantial delegation. Digital Futures hosts an interesting mix of municipal and regional leaders, and now also gets more attention from provincial government (at the federal level, there was also an ISED policy presentation). For me, the most interesting presentation was by Stephen Bull — Service Alberta’s Assistant Deputy Minister for the SuperNet Secretariat. By the sounds of it, Bull has made a significant impression in his first year on the job, and at last week’s Digital Futures he provided some important statements about SuperNet, at a time when the future of the network is at an important juncture (see previous post). -The SuperNet contract will be decided before the end of the summer. Axia, TELUS and Bell are pre-approved to submit for an RFP, but it sounds like the Government of Alberta (GoA) is still figuring out what it wants. A key question is what role different actors are going to play (local champions, different levels of government, the “ISP community”). The Premier has had one briefing on the issue, but asked for a second one — so this file has her attention, and things seem pretty wide open. -What does the GoA think about SuperNet as it currently exists? Well, according to Stephen Bull, the primary rationale for the network (connecting public facilities) was achieved, but last-mile connections for rural properties are a big outstanding issue. Service Alberta counts 36 ISPs in Alberta (others at the Symposium counted 38-40), but that doesn’t mean there is last-mile competition across the province, and we should be realistic about what market forces can achieve (“Myth #6: The private sector will solve this issue”). SuperNet 2.0 seems like it will continue to have the goal of improving connectivity beyond public institutions, but Service Alberta seems aware that this has been a key weakness of SuperNet 1.0, and wants to improve how ISPs (including new, community-owned ISPs) connect. -Stephen Bull didn’t have very positive things to say about the existing SuperNet contract, and provided some fascinating background about how Bell and the GoA’s interests were negotiated in 2005. The result was a poorly-written contract that’s open to interpretation, provides few enforcement options for the government, and isn’t clear on the roles of the different parties. Presumably, even if the fundamentals of the relationship stay the same (with Axia maintaining its role as operator), these issues will be cleared up. -One big question is just what the current state of the network is, and a government audit is underway to figure this out. In 2035 the GoA has the option to buy the Extended Area Network (currently run by Axia) for $1, but what exactly would they be buying? It wouldn’t a singular network, because a lot of it is composed of leased fibre lines. Also, there are old electronics in need of repair (maintenance costs, previously covered by Bell, are actually a big part of the reason for revisiting the contract). -The advice for communities is to “think very carefully before entering into any long-term agreement with an ISP before the future of SuperNet is known”. The worst-case scenario is a well-connected community that goes dark because something happens to the ISP (the advice being to include an option for a community to buy the infrastructure if an ISP leaves a jurisdiction). -Finally, Stephen Bull expressed his perceived need for a provincial broadband strategy, which in his view would require finding a Ministry with the funding, capacity and will to do it (this is not the Service Alberta mandate). If no one is willing to take the lead on this at the GoA, folks at the Symposium wondered if we could produce something more bottom-up, and get the GoA’s blessing. Some of this is now being coordinated through the Van Horne Institute, and will be the next step for some Digital Futures participants. In the two years or so since I attended Digital Futures 2015, broadband issues have exploded across rural Alberta. This hasn’t been uniform by any means (things are moving faster in the South than in the North), but whereas a couple of years ago it was tough to get many local governments to take the issue seriously, now councils have generally recognized how vital broadband is, and many are trying to improve connectivity. They’re working in partnerships with each other or making their own industry deals, principally with Axia. For a lot of regions and communities doing this, an early step is to get a consultant to tell them what the options are, and from the sounds of it Craig Dobson from Taylor Warwick has been winning the contracts for most of this work. A lot of rural communities are still at this research stage, but the hurdle of convincing rural governments that the internet matters has mostly been overcome.